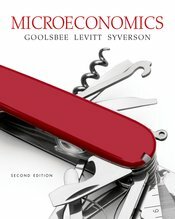 Like no other text for the intermediate microeconomics course, Goolsbee, Levitt, and Syverson’s Microeconomics bridges the gap between today’s theory and practice, with a strong empirical dimension that lets students tests theory and successfully apply it. With carefully crafted features and vivid examples, Goolsbee, Levitt, and Syverson’s text helps answer two critical questions students ask, "Do people and firms really act as theory suggests?" and "How can someone use microeconomics in a practical way?" The authors teach in economics departments and business schools and are active empirical microeconomics researchers. Their grounding in different areas of empirical research allows them to present the evidence developed in the last 20 years that has tested and refined fundamental theories. Their teaching and professional experiences are reflected in an outstanding presentation of theories and applications. It’s a rare thing to say when you find an actual textbook you like to read. I like the Figure it Out sections the best. These types of examples are what I find to be the most useful when it comes to learning a new concept that involves a mathematical procedure.